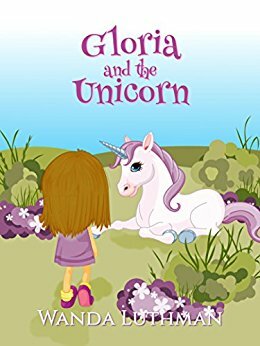 Gloria And The Unicorn is a fantasy story about a child who has a secret. This book explores how she copes with her differences and her secret as she begins to develop her passion for learning. This story follows Gloria as she explores her self-worth while living in a children’s home. Her mother passed away when she was born due to her difficult birth. Gloria is left with a physical deformity because of her birth circumstances. As she grows up she realizes she is different from the other children. Sir Louie is a unicorn in a magic land. One day he feels he suddenly has a purpose in life, and he appears to Gloria – in the land of mortals – when she needs him most. Sir Louie inadvertently bestows some magical powers on Gloria and, as she learns to read, she is transported inside the stories! I started reading this book with Emma, who is 8. She actually had no interest in this book. I think if we had read past the first chapter in one sitting she would have had a different opinion. The message of learning and growing is powerful in this book. Gloria struggles with her difference through the entire story, but in the “magical realm” no one minds her physical deformity. This gives her courage and self-worth and she brings some of that home to her real life. It’s a great story for children who may be struggling with bullies or other social issues. Book Review: Newfie, Come Home!